Martha, Countess of Lindsey was the daughter of Mary Morris and Sir William Cockayne (1561-1626) the first Governor of Ulster and a much respected Lord Mayor of London, and trusted confident of King James I. Cockayne was a scion of the Cockayne family of Ashbourne Hall, Derby and he amassed a great fortune and purchased numerous estates, including Rushton Hall. He gave each daughter £10,000 on marriage, a considerable sum in those days. Since her father was so well connected at court his daughter was able to make a good marriage and so Martha married, John Ramsay, 1st and last Earl of Holderness in July 1624, but sadly he died in 1625/6. Widowed and childless at 20 years of age, Martha, now Dowager Countess of Holderness, received a pension of £900 per annum from the Exchequer, in addition to an annuity of £1,000 per annum from her estates and a richly furnished house in Kingston-upon- Thames. Property of the Will Trust of the Late Lady Muriel Barclay-Harvey, until 2014. A very short time later, on 18 April 1627, she remarried to Montagu Bertie, 2nd Earl of Lindsey. Martha was a very desirable bride as she brought much-needed funds to the financially troubled Berties at Grimsthorpe Castle, Lincolnshire. This second marriage elevated Martha to the pinnacle of wealth, privilege and influence for her second husband, Montagu Bertie, was a much-trusted aide to the King and, subsequently, many of their eight children married into other aristocratic dynasties. Most probably painted in 1627, this portrait captures our rich heiress at a pivotal moment in her life: the year of her second marriage to Montagu Bertie. She wears a black over-gown with a bodice and skirt of embroidered oyster silk, tied with striped ribbon at the waist. This ribbon also keeps in place the paned and padded figure-of-eight sleeves known as ‘virago’ sleeves. 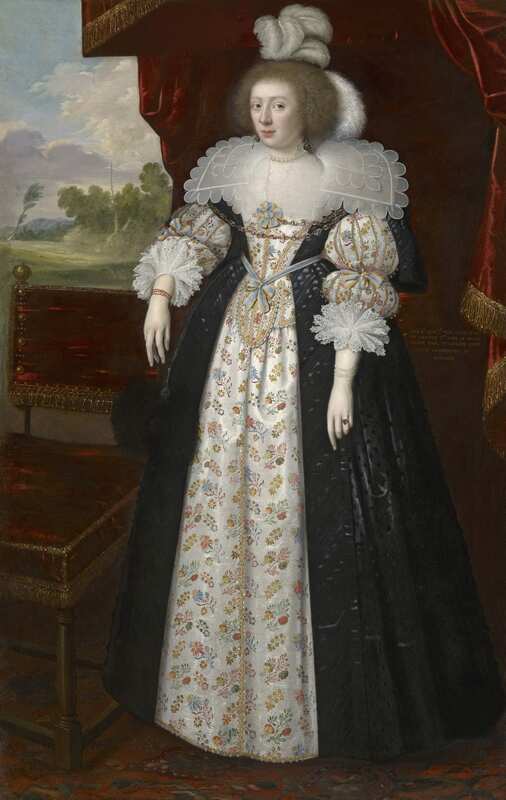 As a truly fashionable English beauty, Martha has taken as much care in choosing her accessories as she did her dress; the large double-collar, the feathers in her hair, and a black ostrich feather fan completing her costume. She stands by a chair under a red canopy, and the landscape beyond shows a withered tree stump, perhaps a symbolic reference to her recently deceased first husband and their childless marriage. Our attribution to the Flemish portraitist George Geldorp (c.1590 – 1665) is based on stylistic comparison with the artist’s full-length portraits of his earliest English patrons William Cecil, second Earl of Salisbury, and his wife, Catharine Howard, painted in 1626. These pictures, now housed at Hatfield House in Hertfordshire, reflect a disposition of comfortable elegance shared with our portrait. The most notable similarity between the Hatfield portrait of Catharine and our picture are their near-identical environments: both are presented under a heavy velvet canopy before a blustery capriccio exterior. This is, one can assume, a recurring template that Geldorp designed to display his well-endowed sitters with appropriate grandeur and humility. The statically posed ladies in their grand conically-shaped dresses suitably dominate the compositions. It would be fair to say that relative to Catharine Howard, the Countess of Lindsey is presented more ostentatiously, in fitting with her higher status. Her lace collar is wider, she wears a costly chain across her chest, and the ribbons and rosettes on her dress are of blue and yellow family livery. This show of finery displays her very able means through birth and two marriages. The son of the painter Gortzius Geldorp (1553 – 1616), George Geldorp was born in Antwerp where he was admitted Master of the Guild of St Luke in 1610. He arrived in England in 1623 and built his career by working for the second Earl of Salisbury and his wife. The portraits that Geldorp painted during his early years in England are in an Anglo-Netherlandish style similar to that of his courtly-based contemporaries Daniel Mytens and Paul van Somer. Later in his career he supplemented his income by becoming an art dealer and seller of picture frames. It seems apparent in the latter stages of his life that he was creatively stifled, so much so he eventually became a sought-after copyist of works by Van Dyck for in June 1653 Richard Symonds saw an ‘abundance of Coppyes of Ritrattos of Vandyke’ in Geldorp's house. Aileen Ribeiro, ‘Fashion and Fiction: Dress in Art and Literature in Stuart England.’ London, 2005, p.119. Geldorp's original receipt for the paintings and frames reveals that the gilding was done by his wife. See Oliver Millar, ‘Notes on British paintings from archives: III’, Burlington Magazine, 97 (1955), pp.255–6. Presumably that of her new husband’s family: the Berties.